You are curenlty in Kimberly-Clark Professional Mic-Key Low-Profile Gastrostomy Feeding Tube Kit, Silicone, Tapered Distal Tip, Dehp-Free, Ethylene Oxide (eto) Sterilized, 16fr 3cm L Stoma, 5ml Balloon made by Ballard and asigned to category. kimberly-Clark Mic-Key Low-Profile Gastrostomy Feeding Tube Is A Step Up From Conventional Gastrostomy Feeding Tubes. Highly Popular And Widely Prescribed, The Mic-Key Feeding Tube Is Unobtrusive And Easy To Conceal, Making It An Ideal Feeding Tube For Virtually All Individuals. It Is Unobtrusive And Easy To Conceal. Minimal External Surface Area Allows Air Circulation Around The Stoma. Ease Of Care Encourages Patient Involvement And Self-Sufficiency. Also Minimizes The Chance Of Gastric Leakage. Less Cumbersome Than Conventional Gastrostomy Tubes For Active Patients. Low-Profile Design Makes It Unobtrusive And Easier To Conceal. Tapered Distal Tip Recessed At Recommended Fill Volume. Ventilated Secur-Lok Ring, The External Retention Mechanism Designed To Allow Air To Circulate Around The Stoma Site And Reduce Tube Pressure 360° From The Sides Of The Stoma Wall. Patented Universal Connector, Designed To Preserve Tube Life And Minimize Unintentional Disconnects. You have selected Kimberly-Clark Professional Mic-Key Low-Profile Gastrostomy Feeding Tube Kit, Silicone, Tapered Distal Tip, Dehp-Free, Ethylene Oxide (eto) Sterilized, 16fr 3cm L Stoma, 5ml Balloon from Enteral Feeding Supplies. We hope that this Kimberly-Clark Professional Mic-Key Low-Profile Gastrostomy Feeding Tube Kit, Silicone, Tapered Distal Tip, Dehp-Free, Ethylene Oxide (eto) Sterilized, 16fr 3cm L Stoma, 5ml Balloon made by Ballard is what you were looking for. 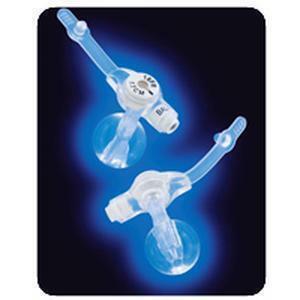 If you have any questions about this particular Kimberly-Clark Professional Mic-Key Low-Profile Gastrostomy Feeding Tube Kit, Silicone, Tapered Distal Tip, Dehp-Free, Ethylene Oxide (eto) Sterilized, 16fr 3cm L Stoma, 5ml Balloon or any other products from Enteral Feeding Supplies, please call us. We have an experienced staff that will gladly help pick out the correct Kimberly-Clark Professional Mic-Key Low-Profile Gastrostomy Feeding Tube Kit, Silicone, Tapered Distal Tip, Dehp-Free, Ethylene Oxide (eto) Sterilized, 16fr 3cm L Stoma, 5ml Balloon for you, also. If you are looking to make a purchase of Kimberly-Clark Professional Mic-Key Low-Profile Gastrostomy Feeding Tube Kit, Silicone, Tapered Distal Tip, Dehp-Free, Ethylene Oxide (eto) Sterilized, 16fr 3cm L Stoma, 5ml Balloon in large quantity or you are a Hospital or Medical facility and need help on making a purchase of Kimberly-Clark Professional Mic-Key Low-Profile Gastrostomy Feeding Tube Kit, Silicone, Tapered Distal Tip, Dehp-Free, Ethylene Oxide (eto) Sterilized, 16fr 3cm L Stoma, 5ml Balloon made by Ballard, please contact us.